For use as a raised toilet seat or toilet safety frame. Features durable plastic snap-on seat, pail with lid, and splash shield. Armrests for added comfort. External leg extensions with seven height adjustments fit wide variety of users. Angled legsfor increased stability. Gray, powder-coated steel frame. Weight capacity: 300 lbs. Lifetime limited warranty. 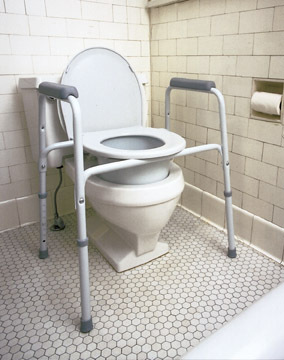 This cream color commode has three versatile functions: as a commode, a raised toilet seat, or as a toilet frame. Its removable back allows for easy placement over toilet.